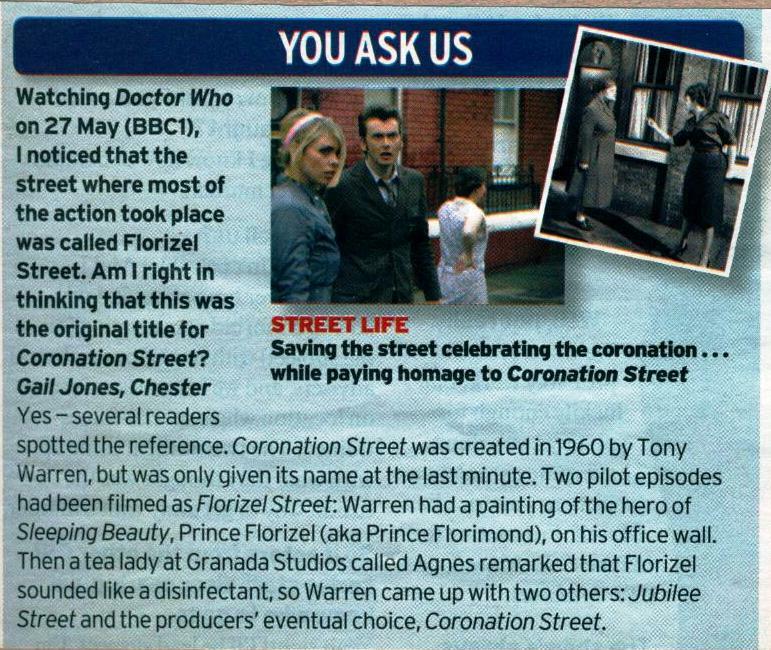 Watching Doctor Who on 27 May (BBC1), I noticed that the street where most of the action took place was called Florizel Street. Am I right in thinking that this was the original title for Coronation Street? Yes - several readers spotted the reference. Coronation Street was created in 1960 by Tony Warren, but was only given its name at the last minute. Two pilot episodes had been filmed as Florizel Street: Warren had a painting of the hero of Sleeping Beauty, Prince Florizel (aka Prince Florimond), on his office wall. Then a tea lady at Granada Studios called Agnes remarked that Florizel sounded like a disinfectant, so Warren came up with two others: Jubilee Street and the producers' eventual choice, Coronation Street. APA 6th ed. : (2006-06-10). You Ask Us (2006-06-10). Radio Times . MLA 7th ed. : "You Ask Us (2006-06-10)." Radio Times [add city] 2006-06-10. Print. Turabian: "You Ask Us (2006-06-10)." Radio Times, 2006-06-10, section, edition. This page was last modified on 3 February 2016, at 23:34.